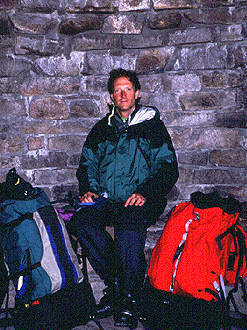 I've backpacked out to the Ionian Basin numerous times in the past 20 years. I've always found its remoteness and its chaotic landscape strangely appealing. Visiting the Ionian Basin on skis was going to be a special trip for me, and one that I wanted to do alone. Covered in snow, the appeal of the Ionian Basin isn't quite so strange. First, travel isn't nearly so difficult as in summer when one must negotiate endless fields of talus and boulders; in spring, it's all covered with luscious corn snow. And second, the Ionian Basin's wild terrain, which slows down the hiking with every kind of slope facing all kinds of directions, is a big plus during ski season; there is fun and challenge wherever you want it. The Ionian Basin is a veritable telemark playground. 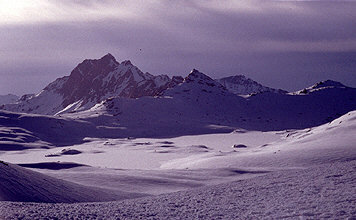 My plan was to enter Ionia, not directly, but from the west, roughly following a traverse of the LeConte Divide described in the first edition of Moynier's guidebook. Nice day, slow but steady. An easy ascent from North Lake to just above Piute Lake, in keeping with my tradition of not camping above 11000' on the first night. There were a few other folks out there, including a couple doing snow survey work. This was a long day, so I started early. I cruised up over Piute Pass, and contoured left over to Alpine Col. 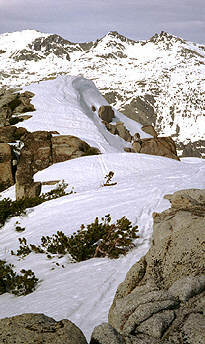 I was following the tracks of some other solo skier, and their traverse line to the top of Alpine became mine as well. On the south side of Alpine, I got nice soft corn snow, and cut tele turns down to the lakes below. I lost the other skier's tracks (which seemed to head left towards Evolution Basin). Lunch just below Darwin Bench. Then I descended into Evolution Valley. A gorgeous U-shaped canyon, though the skiing was slow (with all of the trees and side-streams). Mine were the only ski tracks. I missed several opportunities to cross Evolution creek on snow-bridges early on, and ended up having to ford it lower down. Then I descended to the South Fork San Joiquin River and made camp. It was a tough day. Evo Valley was slow due to uneven terrain (I had to put on skins even though it was downhill on average). Tired out! Here I had a choice, go straight up Goddard Canyon to Martha Lake, or do a gratuitous loop into the LeConte Divide. I figured it isn't every day I find myself with the time and the corn snow to ski such a cool remote range, so, after going up Goddard Canyon a couple of miles, I ascended out of it towards the west, rising out of the lowlands to 11000'. I skied over Hell For Sure Pass, and contemplated the next section of the route. I looked across to Mt. 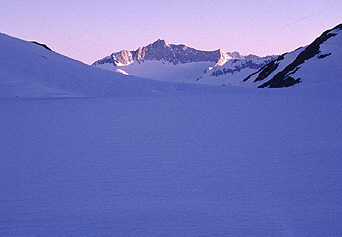 Hutton, and the steep, corniced ridgeline to its left. Oh no. Is that my next pass? Can't be. Um, yes, it is. Hutton Col looked a lot worse in real life than it did on the map. So I took an alternate route along the sharp ridge east of the col. Some of this was quite steep, but at least I wasn't hanging out underneath cornices. Past that, I did a sweet descent to camp at Schoolmarm Lake. Very tiring, very challenging, very scenic, complete wonderful day... I feel like today had everything that a whole ski backpack trip normally does. I followed a chain of small lakes back up to the LeConte Divide, and descended fine slopes down to Martha Lake. I looked up at the imposing Mt. Goddard, part of the scenery for days, but now it was so close. After lunch I ascended Goddard Col, to the south of the mountain, and entered the Ionian Basin. Scylla, Charybdis, the Ragged Spur, and the lakes that were so familiar to me. Good to be back home! I descended to a favorite summer campsite, which even now offered a flat dry rock ledge to pitch the tent on. I'm thrilled to be here! Dry camp (on rock) & with running water @ split-level crossing. Maybe swim tomorrow?... Yesterday's steepness was exhilarating, but it spooked me a bit to be this thoroughly alone being so remote, with so much effort needed to get back to civilization. Today, only 2 days from the car (if I needed to get out), I'm feeling a lot less nervous about the remoteness... Tomorrow: Goddard. If I feel up to it; right now I'm so wiped out that it's hard to get excited about, but I think I'll be into it tomorrow. I took a well earned layover day, and spent it doing a couple of fine peaks. First, Mt. Goddard. This is a peak that I've meant to do on several Ionian Basin backpack trips, but had never gotten around to. But it's so much more inviting a climb on skis. I made it up to the top uneventfully, enjoyed the view, and ripped tele turns all the way down off its east shoulder, stopping only a couple of times to admire my tracks. 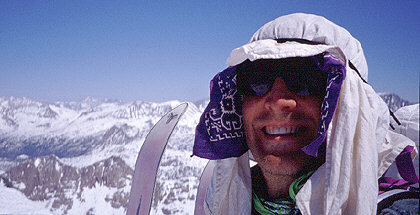 Back at camp by noon, I could not resist the urge to ski the west face of Scylla. It was crusty near the top, but the corn snow was just right the rest of the way down. Incredible day. 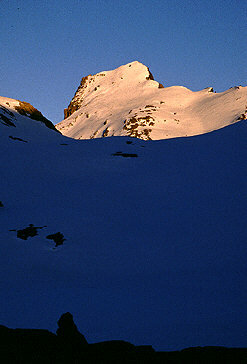 Skied Goddard & Scylla... Great ski descents... Then I bathed. Now I'm tired out. Unbelievable day!!!... 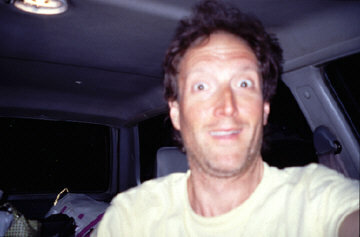 The UV is really getting to me. So intense!! I'm getting burned thru my polypro, face getting burned in spite of careful bandana covering & sunscreen applications. 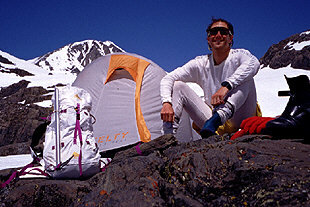 I'm now in my tent, & I still have to wear sunglasses! I slept in a bit, packed up, and continued my crossing of the Ionian Basin. Cooler today, my descent to the beautiful Chasm Lake (11011', at the head of the Enchanted Gorge) was a little on the icy side. I was taking a break there when I saw 4 other skiers, sort of a shock after four full days of solitude. They were doing a day-tour from the hut at Muir Pass. After a brief conversation, they continued on their tour towards Wanda Pass, and I continued eastward. At Black Giant Pass, I dropped my pack to ski just one more peak, Black Giant. The snow was a little icy, but very nice nonetheless. Then I traversed out to Muir Pass, and the hut, just minutes after the others had arrived there. Another beautiful day... Now @ Muir Hut, me & 4 other guys. Nice to be in the shade & out of today's high winds. By the morning, the high winds had died down, replaced by thick clouds and light snow flurries. If it started to snow heavily, there would be avalanche hazard at the passes, so I opted to pop over the nearby Echo Col, over to the east side of the Sierra Crest. I had 2 more days of food and fuel, but my adventure felt complete. I continued to descend, arriving at the Lake Sabrina trailhead at about 5 or so.